In that time, the world of online marketing has grown increasingly complex. When we started HubSpot, there were four or five tools that most companies used to manage their online marketing. Even then, we thought that was a lot. Today, we talk to some companies who are using twice that amount -- just to communicate with their prospects and customers. And the truth is, they aren’t getting any closer to the kind of relevant and personalized communication leads and customers need. So now, there is another opportunity: a chance to help marketers in companies of every size and industry reduce the noise that has made marketing increasingly more fragmented, and get back to the strategy and art that makes marketing people can truly love. Today, I am really happy to introduce you to HubSpot 3. Marketers have grown far too accustomed to CSV files. We spend way too much time importing, exporting, and patching together isolated sets of data just to get a clear view of our marketing. HubSpot 3 was built to be the antidote to all of those extra steps and the fragmented customer experience they create. It all starts with the single, centralized marketing database, your most important marketing asset. The database, which we call Contacts, gives you a complete history of every interaction you’ve had with your leads and customers across channels. Every single HubSpot tool is unified and made more powerful by Contacts. Your emails become smarter, your landing pages more dynamic, and your social media shares more integrated into the rest of your marketing strategy. 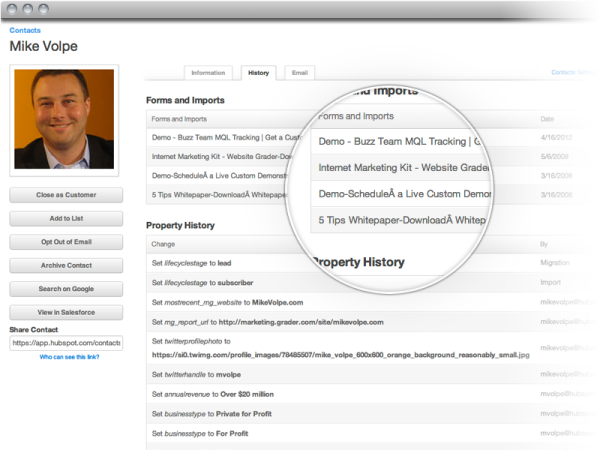 Contacts is your all-in-one marketing control center. Contacts and the Contact Timeline: The central brain of your marketing, Contacts keeps track of what matters to your leads and customers and how engaged they’ve been with your company. Smart Lists and Segmentation: Smart Lists are contact lists based on a set of criteria; they automatically grow and update over time. At the end of the day, inbound marketing is about relevancy. You earn new leads because you publish quality content that is relevant enough for someone to download and read. But what happens after they convert? 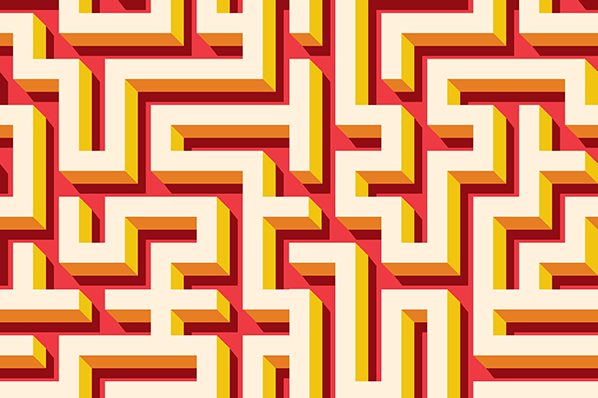 For a lot of marketers, inbound methods stop here -- and they shouldn’t. The way to keep leads engaged and turn them into happy customers is to extend that relevant experience throughout their decision-making process. Here’s how it works in HubSpot 3: A website visitor converts into a lead because they found a piece of content useful. 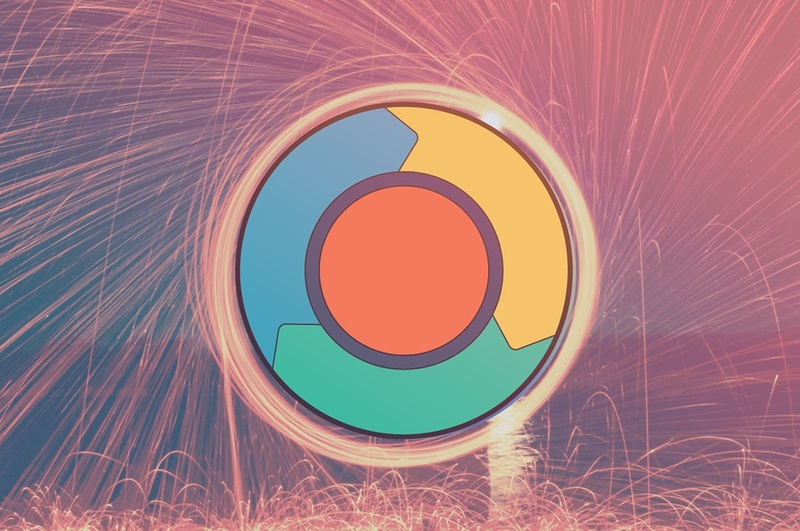 From that moment forward, HubSpot Contacts starts building an understanding of what interests the lead has based on each interaction he or she has with your company. Each one of those interactions informs and shapes all future communications to that specific lead. What’s more, because Contacts stores the lead’s history with your company, it can approximate where the lead is in their decision-making process to help you tailor content that fits that stage of consideration. Because all of your communication tools are in HubSpot, everything from emails to CTAs, forms, and images on your site take on the ability to adapt to be more relevant to each individual contact. 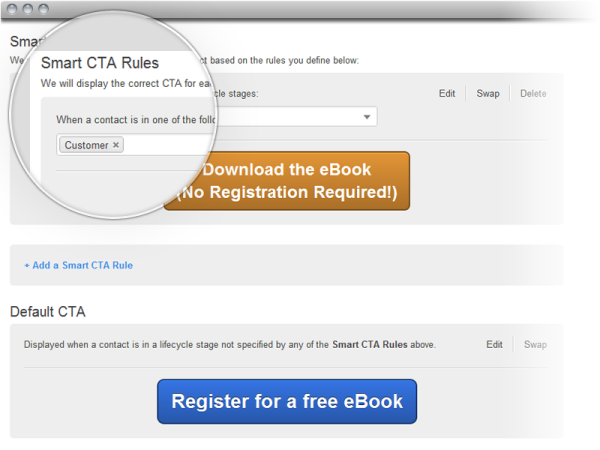 Smart CTAs: Powered by data from Contacts, Smart CTAs enable you to create images and calls-to-action for your website or emails that dynamically adapt to reflect the viewer’s interests, industry, lifecycle stage, or other areas of segmentation. Smart Fields: Smart fields are a long-awaited answer to anyone who is sick and tired of filling out yet another website form with the same information. As you collect more information about your leads, Smart Forms remove any field that has been completed in the past, creating shorter and shorter forms for your leads without sacrificing valuable information. Email: Target specific segments, and personalize your sender, subject, and message body content with any field or custom field from your contact profile. Workflows: Workflows enable you to trigger targeted communications based on a lead’s behavior. A divergence from traditional marketing automation, however, Workflows also allow you to update details in a lead's profile based on activity across channels, including social media. HubSpot has always believed in analytics that run across channels and give you a complete view of your marketing. In HubSpot 3, not only are lead and customer data shared across all of your tools, but we’ve also actually physically tied views from each of the tools into the others, so you can see how each channel is influencing others. Social Contacts: See which of your leads clicked on something you shared in social media, and quickly add them to a list to nurture. 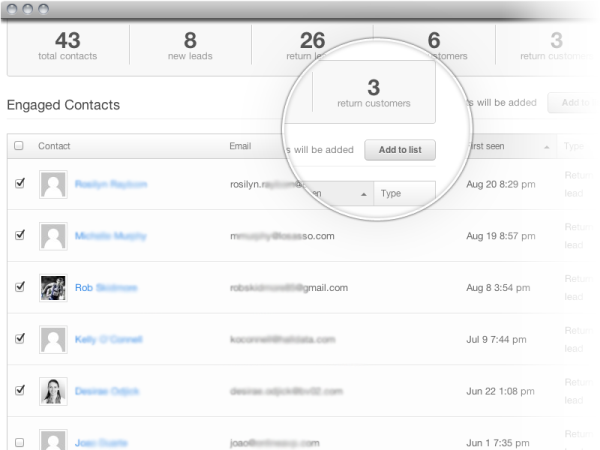 In the Contact profile, see how active each lead has been in social media and how recently they've engaged with you. Landing Pages: Run an entire campaign from one view. Create, test and promote landing pages, then see which channels (email, social, search, etc.) are bringing leads to it. We're in this for more than just software. We’re in it for the love of marketing. It’s that love that’s behind all of the free tools and ongoing training we provide, which we’ve consolidated and re-launched as HubSpot Academy. And it’s the shared passion for good marketing that unites our ever-expanding marketplace of more than 60 add-on apps and 100+ top-notch service providers. 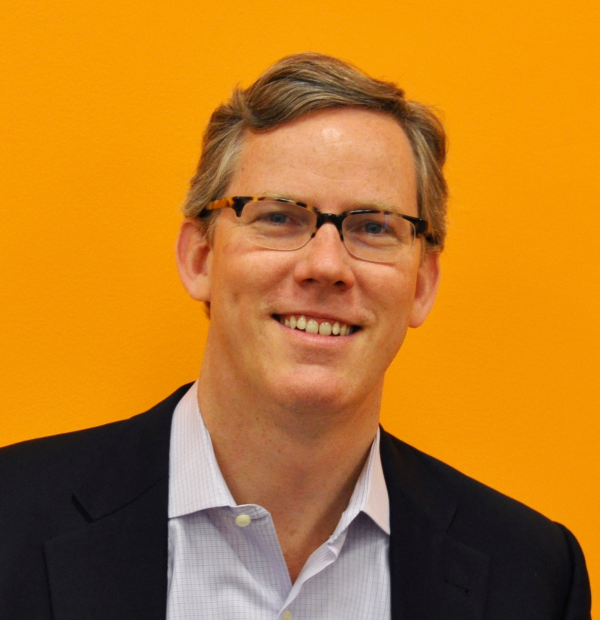 The combination of the marketplace and world-class coaching adds volumes to HubSpot 3. Oh, and did I mention? A way to take this all on the road. 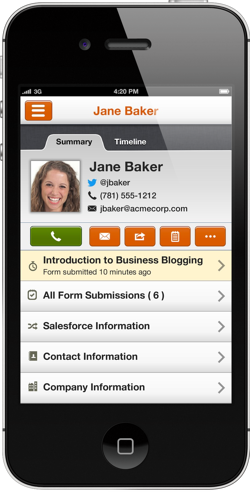 To make HubSpot 3 portable, HubSpot is releasing its first-ever mobile app. The iPhone app -- which can be found in Apple’s App Store -- gives you instant access to your marketing analytics, the award-winning Marketing Grader app, and every lead and customer's contact record with your company. You can even get push notifications when new leads come in, which helps you follow up immediately. Learn more about the mobile app, or download it for free from the App Store. This morning at Inbound 2012, I announced HubSpot 3 for the first time. I am incredibly proud of the work that went into it, and I'm excited for what it will open up for marketers everywhere. I firmly believe that the methodology and platform fueling HubSpot enables our users to create marketing that people will truly love -- an end goal that makes all of us HubSpotters smile. If you’re a customer of ours, you can learn more about migrating to HubSpot 3 within your individual accounts. New customers can purchase the newly released platform at current HubSpot prices until September 1, when prices are slated to increase. An explanation of the full release can also be found at www.hubspot.com/3.